Baghdad and Riyadh are reportedly negotiating a new alliance that would give the latter a leading role in rebuilding war-torn Iraq. The pact also aims to return Iraq ‘to the Arab fold’ and bolster its credentials across the region. Radio Sputnik discussed this with retired US Army Major General and Chairman of the Stand Up America organization Paul Vallely. If this alliance is approved, it could allow Saudi Arabia to shepherd the country away from its main regional rival Iran, according to the Guardian. Iraq and Saudi Arabia have been long considered opponents, but recently relations between the two have improved considerably. The thaw followed a number of high-profile bilateral meetings as well as a visit of Iraqi Shitte cleric Muqtada al-Sadr to Riyadh last week. “There are several different issues here and strategies both by Iran and Saudi Arabia. So what you have here is two competing countries in the Middle East competing for the support of the Shiites and the Sunnis. When you have such a competition going on then, it is what we call the hegemonic power,” Vallely said. He further spoke about the big conflict between Saudi Arabia and Iran. Talking about what Saudi Arabia stands to gain in this alliance with Iraq, the analyst said that there is an “energy component” in there. “For many years now they wanted a pipeline to go across from Northern Iraq through Syria into the Mediterranean and Qatar was proposing a plan like that several years ago. So if you are focusing on those oil fields and that capability then it required tremendous investment of countries that can afford it,” the analyst said. According to Vallely, Saudi Arabia can afford to make an investment like this but again there is the power struggle between the kingdom and Iran about who will control that part of Iraq and Syria if they are restored. Talking about Iraq’s willingness to form an alliance with Saudi Arabia, the analyst said that the driving force is the Sunni-Shiite factor and Iraq is completely split between the Sunni and Shiites. 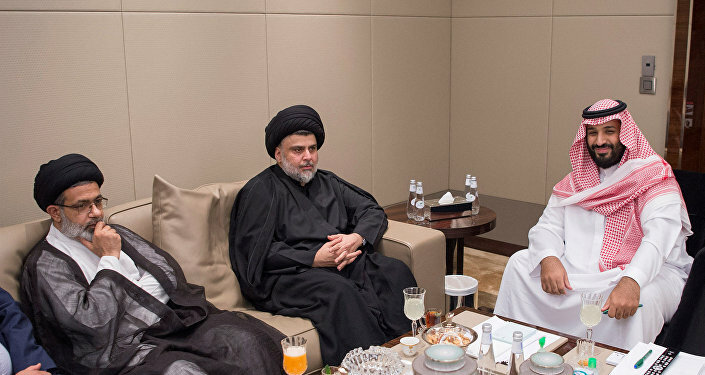 “Iran supports the Shiites, whereas, Saudi Arabia supports the Sunnis. So I estimate that Iraq is looking more at Saudi Arabia because they have more assets, they have more money to bring in to support the rehabilitation of northern Iraq,” the analyst said. Looking at the future of the power struggle in Iraq, Vallely said that some suggest that there should be a split between the two parts of Iraq – the northern and southern province. “But the Baghdad government would want to keep Iraq in total under their control, including Kurdistan. So there are no easy solutions. If the US and Russia, that is Putin and Trump can get together and come up with some solution, they may be able to get this situation solved,” he said. The arrival of Iraqi Shia cleric Muqtada al-Sadr to Riyadh last week highlighted a new level of commitment which could see Riyadh play a vital role in the reconstruction of the predominantly Sunni cities of Mosul, Fallujah, Ramadi and Tikrit. “Broader engagement between Riyadh and Baghdad will lead the way for enhanced regional support for Iraq, especially from the Gulf states. This is essential after the capture of Mosul from ISIS [Daesh] and as Iraq looks towards national reconstruction,” the former Saudi minister of state Saad al-Jabri noted. “We welcome any foreign or regional funding. This would be a really smart move on behalf of the Arab countries and foreign countries,” al-Zabari said. Baghdad and Riyadh had not exchanged ambassadors for 25 years. However, over the past year, Abadi and the Iraqi president, Fuad Masum, have visited Riyadh, and the Saudi foreign minister has travelled to Baghdad.